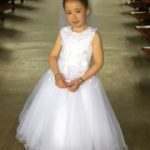 Her is a few pictures of my daughter wearing the Holy Communion dress I purchased. Thanks again for everything. Thanks again for all your help. Sophie loves her new dress and wants to wear it to school. 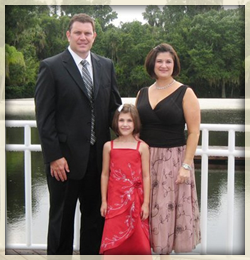 THANK YOU so much for all of your help finding a cotillion dress for my 11-year-old daughter. We looked all over the place before ordering a dresses from you. We were thrilled to find beautiful dresses at reasonable prices. The dresses arrived quickly, fit as expected and were of wonderful quality. Can’t say enough about the customer care I received, too!!! My daughter can’t wait for the cotillion ball to wear her dress! I’ll send pictures from her event. Thank you! Remember me? Here’s just a few shots to let you see how the dresses turned out. Simply lovely. As you can see after all of our work, my niece decided not to wear her veil or leave her long sleeves on. My younger sister was participating in her first pageant and we needed to find the right dress. Through your company we did find the right dress at the right price. I was extremely pleased with my purchase. It fit perfectly and everyone liked it. Thank you for making her look like a star. I now recommend your website to all the parents I know. Keep up the good work and I hope to be ordering from you again in the near future. Thought you would like to see Scarlett & Willow with their backpacks. My daughters were so beautiful with the dresses. You are the best. Also the headpieces with veil Simply lovely. Thank you again. Here are just a couple of shots I took with my camera. The girls were in heaven in their “big girl dresses”. Thanks again for your help! 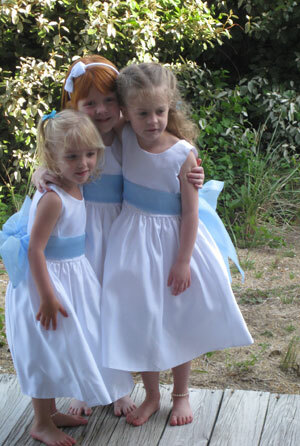 I thought you might enjoy this picture of all the little girls in the dresses we ordered from you. It turned out perfect. The dresses and the shoes were very high quality and your service was excellent. Thank you so much for making our wedding more perfect. I AM SOOOOO PLEASED WITH MY PURCHASE AND THE CUSTOMER SERVICE. 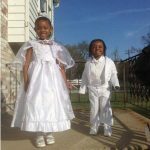 My son and daughter were set to be baptized on 4/10/16. I knew exactly what I wanted for my daughter to wear in my mind. However, b/c she is 4 years old I found it hard to find a “baptism” dress for her in the stores/online. 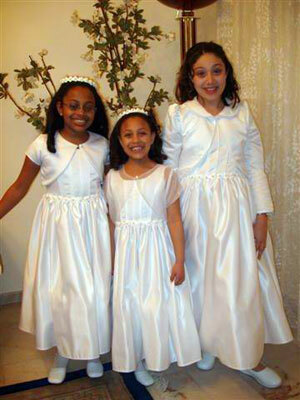 I started to look at “communion dresses” instead and found a few I liked. 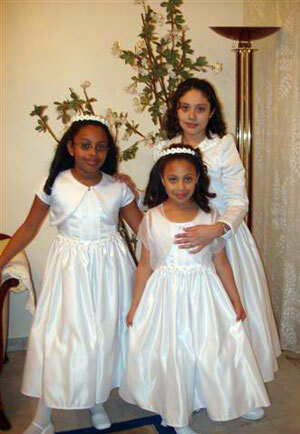 Then I found this site and saw quite a few communion dresses I liked. I was nervous about getting a dress in the mail in time. So I put it off and looked in a few more stores in person. Still didn’t find exactly what I had envisioned. 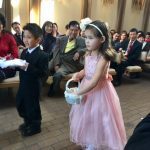 Came back to this site and found that they actually are the only place that I have seen that has “baptism” dresses for preschool age kids. I ordered a dress I loved on Friday April 1st. On Monday April 4th, a representative (Jenny T) emailed me saying that the dress had recently went out of stock and she sent other suggestions. I instantly got so worried. It was less than a week until the baptism. I had originally paid the extra $10.95 for Priority mail shipping but still didn’t know if I should just cancel or order another dress. I found another dress that I loved and knew I wouldn’t find at a store. I decided to take a chance and emailed Jenny back and ordered dress style RK_403 (which was about $4 more than the one I had previously paid for and they didn’t even ask me to pay the difference). She said it would ship out Tuesday morning (mind you, the baptism was the upcoming Sunday). I prayed that the dress would arrive in 3 days by Friday (as UPS doesn’t deliver on Saturday) …. Well the dress arrived on THURSDAY. I was ecstatic. My daughter tried it on and it fit PERFECT (after loosening the side corset some). It was great quality and just as beautiful as the picture online. I will definitely use this website in the future. 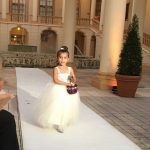 THANK YOU FLOWERGIRLDRESSFORLESS.COM AND JENNY T.
Dear Flowergirl Dress For Less, My family and I were invited to a Navjote ceremony recently and we were scrambling to find the perfect dress for our 7 year old daughter. We had never been to a Navjote ceremony before, but we quickly learned it was an Indian religious ceremony similar to a Christening, but a little more formal and proper. My wife and I had trouble finding a dress in any of the typical department stores that sold girls dresses. We became frustrated because all of the department store dresses looked the same and anyone could tell it was fresh off the rack. We really wanted our daughter to make an impression at the party and we wanted to find the perfect dress. As luck would have it, I recently got in touch with Belinda, an old high school classmate of mine who I learned had opened her own designer dress company (FlowerGilrDressForLess.com). I remembered how talented Belinda was in high school as she designed many of the costumes for our schools theater productions. I remember her winning many awards for her designs and everyone knew she would be very successful in the fashion industry. When I browsed her company’s website, I was amazed at what a large inventory of elegant dresses she had at very competitive prices. My family and I do a great deal of shopping online and I’ve never seen anything like it. Normally a person has to sort through a lot of lousy products on a merchant’s website to find that one item they were looking for. However, that was not the case with this website. It seemed that every dress on this website was of the highest quality and relevance of what we needed in a dress. The elegant dress we ultimately chose (Red satin Aline with vine embroidery with corset back – R5324R) for our daughter was absolutely perfect. Perhaps the most remarkable thing about the dress was that it fit so perfectly, it was as if the designer herself had chosen it for our daughter. We’ve been to several formal parties where the girls’ dresses made the girls look a little silly, like a baby doll. The dress we bought from this website made our daughter look like she walked right out of an Audrey Hepburn movie. The dress’s design was very simple, sophisticated and absolutely gorgeous. Our daughter received numerous compliments about her dress that evening and many people wanted to know where we found it. 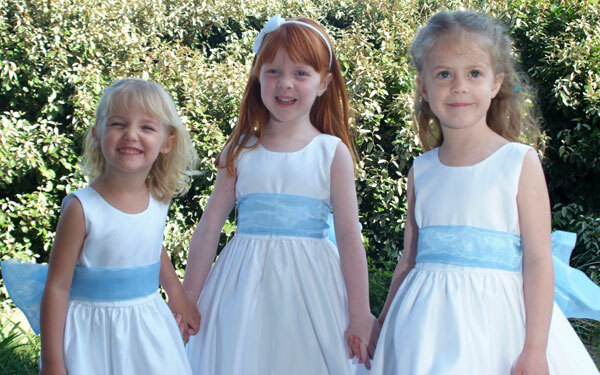 We were proud to tell them we found it at FlowerGirlDressForLess.com. Belinda, you really made our formal evening truly special. We could not have been happier with the dress we purchased. The suit looks really cute on Lucas and yes he finally allowed me to try it on him… with of course Maya wearing her Elsa dress first so he can get excited. Carmel Guinan Brook here from England. 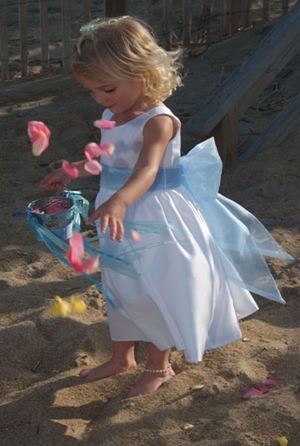 I purchased a flower girl’s dress from you in March 2007 for my wedding in July. Please find attached some photos of Amy in her dress. We had a fabulous day and everyone looked fantastic. Again can I say thank you for your assistance in making my dream day. I just received my flower girl dresses today and I am over the moon excited about how cute they are!!!! I paid half of what I was planning on spending and they are twice as cute. They are well made and the sizing was very realistic. I was so nervous to order online as I’ve heard horror stories but after reading the reviews and seeing the price I thought I’d give it a shot. I’m so happy I did! They are amazing and my girls just love them! I just want to say “Thank You” for doing everything that was in your hands to ship out the dress. I really appreciate that. Thank you all for your great services i really appreciate it. Thank you for always being so helpful. the hand written note from you on the necklace put a HUGE smile on my face. help. You are amazing and I appreciate everything you’ve done for us. She’s going to LOVE it! them on yet but they are beautiful and well made. Thanks for all the effort you put towards helping us. 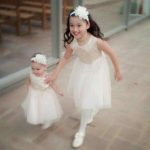 I ordered two different dresses for two different granddaughters. Delivery was speedy! I absolutely love both dresses! I’m so excited about the girlls receiving them for Christmas presents. I’ll definitely be ordering more and have already recommended this site to everyone I know with children. Thank you! The dress is beautiful. My daughter looked beautiful. We accidentally ordered the wrong size and Jenny from customer service quickly find a replacement and get the dress shipped out. It arrived in good time. Thanks! Bought daughter’s 1st Comm. dress for a Sept. ceremony when it was impossible to find a dress at a regular store. So buying thru here was so much better, excellent low prices, big time sale at the time and everything arrived quickly and it was perfect. I recommend this site to anyone. In fact, just sent my Sister in Law, her daughter will have a May 1st Comm. and even now the prices are still awesome! Thank you for offering beautiful, quality dresses at an exceptional price. I ordered the dress and shoes for my daughter’s kindergarten pageant. She rocked the stage and shined bright in her beautiful dress. 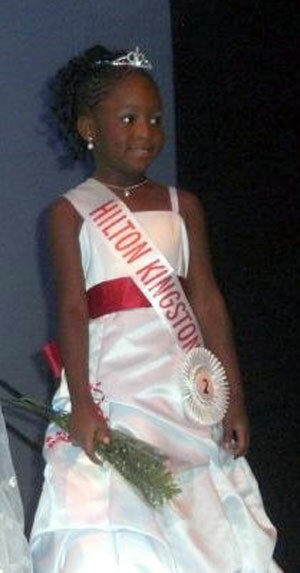 Her first pageant and she won 2nd Beauty. Thank you so much. The dress arrived 3 days early. Quality of dress is exceptional. We will definitely be ordering more dresses and shoes from you all. I purchased a rhinestone tiara for my daughter as she is the flower girl for a wedding later this month. I was super nervous to order it online as you can’t really see the quality of the items by the online photo, but I worried for no reason. The headpiece is absolutely beautiful! It sparkles and shines and is perfect for her little head. I also selected regular shipping and my item was received 2 days after it shipped. I will definitely be ordering from here again. I actually made three individual orders from this site. I’m thrilled with everything I received. Fast shipping and excellent customer service. I’m so glad I discovered this site!! Thanks, Jenny T!!! I just received my order and am very happy the dress and tiara are so beautiful. Thank You so much! This dress exceeded my expectations! 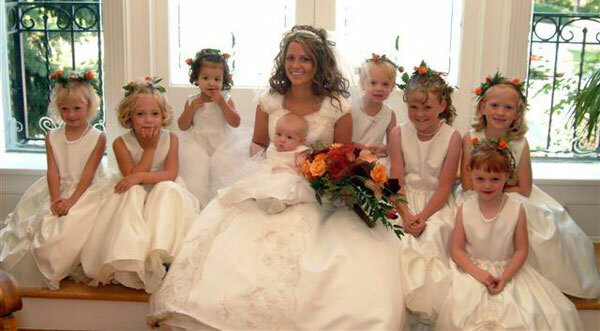 I purchased 5 dresses for the flower girls in my wedding. The dresses are beautiful and they fit great on the girls. I followed the size chart that came with the dress. It was spot on. They were full and the color was vibrant. I chose the deep red. Thanks for a great value! Thank you for your customer service you’re great. We go on a cruise every year and usually get a special dress from you every year. We have always been pleased with the quality and workmanship of each dress. My girls are always Princesses and noticed by the other passengers aboard ship. Dresses arrive on time and packaged so they are wrinkle-free. I have spent the better part of the last two months looking for the perfect flower girl dress for my niece to wear to my wedding. 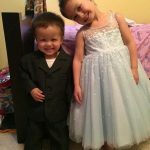 I found exactly what I was looking for on Flower Girl Dress for Less and at an amazing price! The quality of the dress, the price and speedy delivery made for an amazing experience. I wish all of wedding plans could be this easy. Thanks for everything!!! I ordered two dresses, a suite, vest and tie, socks and shoes. Shipping was super fast and I am so excited they all look so amazing and the prices can’t be beat. I will definitely be recommending this amazing company to everyone. Thank you so much! I can’t wait to have the kids try them on! Thank you so much Jenny! Dress arrived so quickly and is so beautiful. Thank you so much for the wonderful service and merchandise. What a fabulous company!! Thank you for your help, the dresses for the dance are wonderful. Both my kids are clothed by you, suit, dress, tiara for a wedding yesterday. They looked really great! Minus their expressions. I just received my order, and am very pleased. You guys really are the best kept wedding secret!!! just to let you know that dresses arrived and they are very pretty. 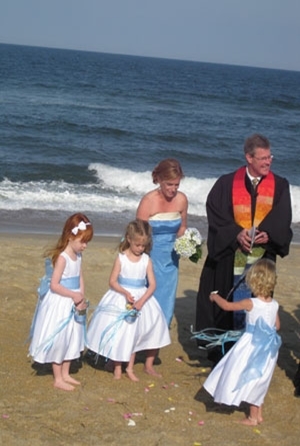 the girls like the feel of satin better than the organza. thank you much for handling the return so efficiently! I just wanted to let you know I received the sashes and they are perfect!! Thank you so much!! That is so wonderful!! I am absolutely going to shop with your company for upcoming formal events! You made a possibly bad experience into a great one!! I’m very happy with the product. 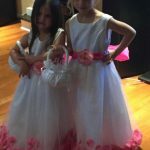 the dress fit very well for my flower girls! this dress and is perfect for the wedding. Thank you again for all your kindness, guidance and dedication, so I could get the dresses. THANK YOU! Again you have been a gem in your superb customer service, it’s a joy dealing with people like you and the company you represent. Thank you so much! I have never experienced such an amazing service before. You are the best! Love buying from you! Thank you so much again for all your help with everything! Your customer service is superb!!! Thank you again Layza…it has been great to always be getting the same person helping on this order…great customer service. I wanted to let you know the new dress arrived this week and my daughter loves it. Thanks for helping us with the exchange. I want to say thank your for the quick response and delivery of the black sashes for the flower dresses I ordered. I received them today and they will be perfect. Thank you for sending the flower girl shoes! They came just in time & looked so breathtakingly beautiful on my 16 month old & 7 year old! You saved the day! Sorry for stressing but just wanted everything to be perfect for the bride! I just thought I would let you know everything worked out just fine & wanted to send you my appreciation. Have a wonderful day! Layza this helps a great deal..thank you for all your time, effort, patience, knowledge and kindness helping us order this very special dress. Thank you soooo much for your awesome customer service!!! I received the replacement dress on Saturday, Oct. 10th. I’m so pleased that the original dress was not available, because the replacement was so much better. Thank you so much!!!! My 8 y/o absolutely loves it!!!! You guys are great!!! I will definitely order from you again! This is a follow up email. Dress we got from you. It was beautiful and everyone… I mean seriously everyone LOVED it! What A wonderful memory to remember.. 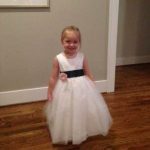 Her first time as flower girl wearing such a stunning dress! Thank you once again for taking us in that day we walked into your office and for helping us find THE DRESS!!! 🙂 Hope you love the pics! Oh and my little boy… Just rocked that suit! He wore it the whole time I was so surprised! He was a little man for sure!!!! I just want to write a quick note to thank you for all of your help. I can honestly say that you are the best customer service representative I have ever worked with. You were so helpful and fast with my order and return issues. I always feel like people are so fast to point out all the negatives that happen in life and forget to address the positives. 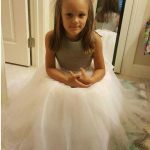 So, thank you for all of your help with my flower girl dresses. You deserve a raise! Hope your afternoon is going great! Thank you again so much! I will be happy to share the photos when I have some. You have been wonderful. Can’t thank you enough. Thanks again. It has been a pleasure doing business with you. I will recommend more people to your site.And the dresses look beautiful. That is great news! Thank you so much for remaining in contact and being so polite. Please tell whomever you think will benefit to know that working with you and Layza has been very satisfying. Despite news of the dresses being on back order this overall experience has been very pleasant. I will certainly purchase for you all again.Also, I have already recommended flower girl dress for less to several of my friends that have events coming up. Thank you so much for your help and time. You and the other employee I have dealt with have been very nice and helpful! I wanted to let you know that all 4 dresses arrived yesterday – – and they are beautiful!! We are extremely happy with them and appreciate your help!!! Your service has been incredible!! Thank you so much for all the hard work you put in to getting my little girls dress in on time! I really do appreciate everything you did! The dress is beautiful and she loves it! Thank you so much for such great customer service!! Hi Layza, thank-you for all you effort, the Baptism gown arrived today as promised and it’s Beautiful… My God son is going to look like a prince! Thanks again God Bless you and your family. very much for being so quick with your replies and assistance. We received the dresses, tried them on and are getting them pressed and ready for the big event. They fit perfect and the bride approves! Thanks for your wonderful and speedy support. Appreciate all the correspondence too. As an update, I received the size 8 flower girls dress last Friday, so thank you! The fabric was also a perfect match to the size 4 dress fabric previously ordered through Nordstrom, and the size 8 was a perfect fit. A successful order indeed! Thank you again for your tremendous customer service! Amazing service. I got the dress today and it is beautiful!!!!!! 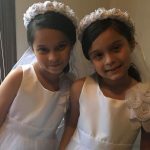 I almost completely forgot to send you a pictures of the girls First Holy Communion in their dresses! They looked absolutely beautiful and we cannot thank you again for having the most beautiful dresses, affordable prices, and kind people at your company! Thank you for your customer service. I really appreciate all of your efforts. 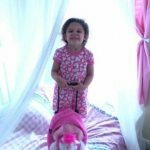 Before you reached out to me, I was done with Flower Girl Dress For Less Inc. I am so satisfied and I appreciate you going above and beyond. I am now a completely satisfied customer! Just had to drop you a note and let you know the dress arrived today!! !I could not be more pleased with it!!! It is stunning!!! Can’t wait to see my niece in it!! Thank you for everything !! You were wonderful and I will recommend you very highly!!! Your are a tremendous employee. I look forward to my shipment. correspondence is also of a very high standard. Hi Layza, just wanted to tell you the dresses are beautiful and they all fit very well. I don’t know who’s more excited, the flower girls or the bride to be. thank you for all of your help with holding and ordering the dresses. we appreciate you! difference in how this all turned out (my sanity included!). I will be so happy to send you a picture of our little man on the big day! Thanks so much, Layza. You have provided me amazing support. I am impressed by and very appreciate of the personalized response to my order. Please accept my highest compliments for the excellent customer service. I received the dress. It is just right and comfortable for my daughter. Thank you so much for your help! I want to sincerely thank you for all your help! You are the best. I just finished the order with Sasoon. Woo Hoo…….. Thanks for your help with the ordering! Photo at wedding in Jerusalem, Israel on Wednesday. Once again just received the most beautiful and adorable dresses for my granddaughter. Your mail service is outstanding living back east the delivery is quick and efficient. Your sales are unbelievable, just can’t beat the prices as well as the quality of merchandise. I will forever be a loyal customer! The dresses came exactly on time. Quality is good, perfect size. Thank you again for all your help. The dress is perfect. 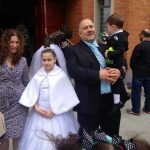 Here are some photos of Makayla on her First Communion Day wearing your dress / flower veil and gloves smile emoticon. Was a little scared with the quality of the dress, but I’m at peace now, receiving my package seeing this dress and accessories was a wow for me. Thank you very much, for the fast emails, and shipment . Looking forward in continuing shopping here in the future, Again thank you. Thank you very much Layza. You have been so professional and I appreciate your help.